The joint statement signed that came out of the visit, however, only stated that China “understands and supports India’s aspiration to play a greater role in the United Nations including in the Security Council.” In other words, India has no option but to wait for unambiguous Chinese support. It has become a customary feature during high-level official visits for the Chinese side to merely “understand and support” India’s aspirations for a greater international role. As long as both nuclear-armed Asian rivals find themselves at odds in reshaping international institutions, including the UNSC, Asia can never hope to have a stronger voice in the world. The fate of India’s bid is mainly in the hands of the veto-wielding permanent members of the UNSC, and China is the only veto-wielding permanent member that has yet to extend unequivocal support to India’s bid to become a permanent member. Any accommodative shift in China’s position on permanent seat is likely to recalibrate Beijing’s ties with Islamabad, as the latter has been vociferous in opposing India’s entry to the SC. Beijing is not likely to upset its “all weather friend” at this juncture, undermining the centrality of Pakistan in the China’s geopolitical calculus. Beijing also fears that India’s entry into the UNSC would be a huge loss for China’s current global status and prestige among the third world countries. Another factor for China is India’s solidarity with Japan, China’s arch rival, in making a joint bid for the UNSC membership. A careful reading of the paragraph pertaining to China’s support for India’s membership of the UNSC shows that even the wording of the statements has remained unchanged over recent years. China has perfected the knotty art of saying neither yes nor no. India’s frustration at being denied entry into the world’s most elite club is compounded by the fact that China is the only developing, non-Western, Asian country wielding veto power in the UNSC. 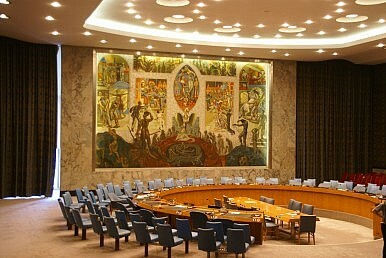 In fact, India vigorously supported China’s entry into the United Nations and the Security Council as well. Citing Indian diplomats who have seen the relevant documents from that era in the 1950s, Shashi Tharoor claims that Nehru “declined” a U.S. offer to take “the permanent seat on the United Nations Security Council then held, with scant credibility, by Taiwan, urging that it be given to Beijing.” Because America’s realist offer went against the grain of Nehru’s idealistic vision driven by utopian aspirations of Asian solidarity, India was denied the golden opportunity to become one of the “fortunate five.” This fateful decision continues to haunt India. Delhi’s quest for a permanent seat on the UNSC continues to meet with Chinese ambivalence at best, or resistance at worst. Although Beijing has made sympathetic noises in bilateral meetings with Delhi, China has been attempting to defeat any collective diplomatic effort to expand the Security Council’s permanent membership. Addressing the Indian community in Paris during his French tour last month, Modi made a strong pitch for India to be given a permanent seat, arguing that the “time is over when India would ask for a favour; today India is asking for its rights.” It remains to be seen how long Modi’s India will have to wait for those rights to be granted. Vinay Kaura is an assistant professor in the department of International Affairs and Security Studies, and Coordinator at the Centre for Peace and Conflict Studies, Sardar Patel University of Police, Security and Criminal Justice, Jodhpur, Rajasthan, India.